New Wheels for E46 Saloon? Discussion in 'E46 (1999-2006)' started by bradley01, May 12, 2008. I am contemplating getting some new wheels for my '02 330xi. I am torn between these three types. What are your opinions? I would love to see pics of these wheels on your cars if you can post them? Which exact model is your E46? Is it the pre-facelift version or the facelifted one? If it's pre-facelift, I recommend the M-Parallel wheels. They're a bit older, but I saw them on a pre-facelift and thought it was hot. The CSL wheels are really slick and cool looking, and the facelift models are just that, so they'd be an awesome match. post pics of each wheel. however i think M3 stockers are ugly, M parallels, fit any damn BMW, but i cant say ive ever seen one ona E46, so that might be fresh looking. and you CANNOT go wrong with CSL reps.
OK...for your viewing pleasure, I present...my wheel choices! So, ur thoughts? I have seen one E46 with the M-Parallels...and it was sick! I really like them because they are simple...not overwhelming. And they have a huge lip on them. I really like that for some reason. Thoughts? Oh, and does anyone know how to photoshop? I would really love to see these selections photoshopped onto my Facelifted '02 330xi. I am attaching a side profile shot of my car. Thanks! Which exact model is your E46? It is the facelifted 330xi. See, you're saying "be different" but everyone that I have seen on e46fanatics has the CSLs...not too many have the M-pars. Even fewer have bothered with the M3s...prolly because they are the most "expected". Well, I LIKE the CSLs...but I would also like to have the M-pars...tough choice! I say M Parallels. They would be easier to clean. Also, to my knowledge, the CSL wheels aren't supposed to have a lip, which is what makes it mostly so appealing to me. Those just don't look very original with that lip. Some rims look good with a lip but not that one IMO. If it didn't have the lip, I'd say CSL would be a good choice, but I still think it's worth the fact that the M-Par's are easier to clean AND look good to boot. That looks sweeeeeeeeeet in my eyes. The E46 looks better than the Z3 as well, so I think those will look gorgeous on your 330. +1 for easier to clean!!! the LINK that I posted up there is to CSL wheels w/out a lip. The pic didn't come through for some reason. They look pretty cool! Oh, and I voted finally. The only thing I could find (in a hurry) were pics of the m-pars on a 5er...and they looked awesome! These pics were the reason I even considered m-pars in the first place! If it has a lip, its not CSL reps. CSL reps means its a replica of the OE M3 CSL rim, which cost like $$$$ a pop from the dealer. 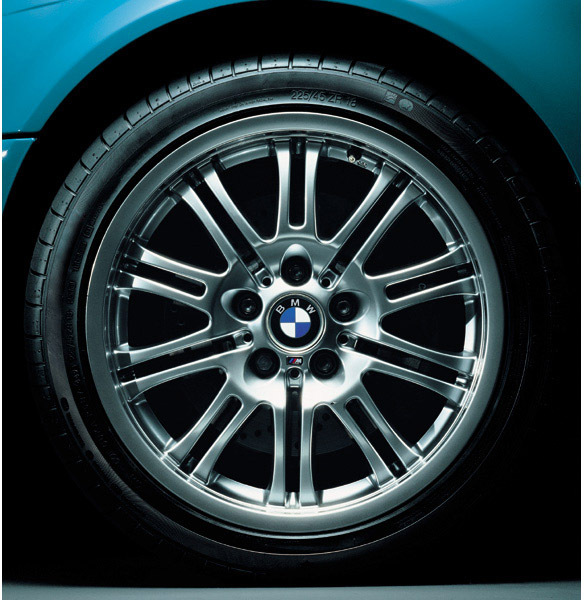 The M3 performance package is just like the original CSL rims, but not as wide. That rim, shown is just another mesh style rim. My neighbor has a facelift coupe with chrom M parallels. It looks ok, but chrome disgusts me, so its hard to look at more than 5 seconds. Looks ok. But I think parallels belong on big cars. If u have a sedan, I'd give em a shot. Get em in a shadowline type color, that would be pimp. My fault. I thought CSL Replicas meant they were close to looking like the original CSLs. Not exactly the same, nor from the same manufacturer...but a close variation. I misused the terminology. I agree with you that the M-Pars belong on the bigger cars. They sure do look sweet on the E39s! I was just wondering how they would look on my E46...in a machined (or silver) finish. NO CHROME!!! That's too.........ethnic. Chrome is too ethnic. Wtf! Lemme gtfo and go calm down before I overreact. When I think chrome wheels, the only thing I imagine is 26" monster wheels on a 1988 Caprice Classic with a 12" lift. It may just be the neighborhood that I live in and how I see them all the time, but THAT just does nothing for me. On a different note, my dad had chrome Kragars on his '74 Charger. Those looked classy. I guess when used in moderation and with a certain savoir faire, chrome can add a little something to any car. Forgive me for being vulgar. Have you made a choice yet? I have not yet. I am leaning towards the Velocity CSLs in silver. They have nice thin spokes which I like. It's still a toss-up between the dished and non-dished ones though. M-pars are still a close 2nd though. what color is your sedan. you have got to get that darkish type finish on CSL reps man. or the same darkish finish on parallels.